Finding the best cat supplies for your cat is not always easy. I should know i used to find myself spending ages looking around for the things I knew my cat would like such as a warm and cosy bed that my cat would actually use and litter trays which kept my home clean and tidy. So I have written this and the following pages to help you meet your purrfect pet's feline needs. Here you will find great pet supplies so you can ensure they are kept healthy, happy and entertained. 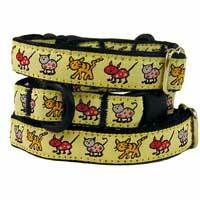 It seems there is an endless variety available these days, so how do you choose the best cat collar for your pet? Perhaps you think safety first and want a reflective breakaway collar? Or maybe yours is a real glamour- puss who would be more suited to a fancy designer collar? Find out more about the benefits of each type of cat collar here so you can choose the right one for your individual kitty. Whether it's a trip to the vets, moving home, going on holiday or visiting friends, you will always want your pet to travel in safety and comfort. 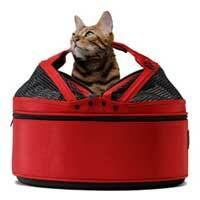 And choosing the best cat carrier to meet those needs doesn't mean you have to sacrifice style! From carriers for nervous cats, or ones that give easy access for the vet, to carriers that have all the style of a designer handbag. I have highlighted the different types of cat carrier here which give you the best choice in style and function. 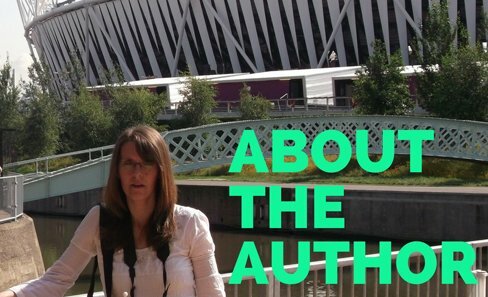 You can also read my handy checklist of travel safety tips! Cats like to have their own things, which they can associate with their territory and home. My two new boys, Byron and Shelley, certainly don't like to share the same bowl! So another cat supplies essential is buying a feeding bowl that your kitty can easily eat from. I once saw a small kitten trying to eat from a dish that had high sides, and in the end I think he just climbed right in! However the best bit about buying these items is that you can choose something that matches your pet's personality. Do you have a diva that will only eat from the best china or a cheeky chappie who likes something a little more humorous? 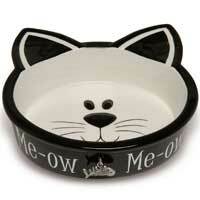 See some of my favourite cat bowls here! Automatic cat feeders are great if you are out at work all day but you still want your feline companion to be able to eat at set times! Leaving food out for them often means that either they will eat all their food in one sitting, or that the food sits in the bowl and goes stale. Worse still is that flies can get at the leftover food and lay eggs in it, meaning your pet can be at risk of getting worms! These clever pet feeders solve such problems by allowing your pet access to their food at set times while keeping it fresh. Find a few of my favourites here. There are also water fountains that ensure your pet has a ready supply of enticing fresh running water. 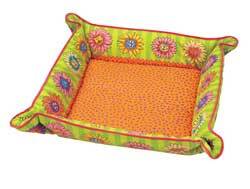 One of the first cat supplies your pet will need is their very own cat bed. With the right choice, it will be something they will grow to love and will be central to their territory. So how do you make the best choice when there are so many different types available? I have written this short guide to help you here. Will my kitty feel comfortable and secure in this bed? Will it be easy for me to clean? Does the colour scheme match my living room? Would my lovely pet prefer something high-sided or a big cushion instead? With the choice of cat bed you can see here you will be certain to find the right one to suit both your feline friend's personality and home environment. Many owners like to talk their pet for a walk especially if they are not normally able to go outside. So we have included on this cat supplies page a way to do this safely. It can be a safe way for your kitty to be able to explore the great outdoors and get some exercise. And all the time they can have you, their guardian, looking after them! You can find out here why you should never simply attach a lead or a leash to a normal cat collar. It is far better to use a proper cat harness that is specifically designed for the purpose. 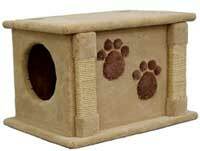 Cat Furniture – Towers, Scratching Posts and more! Even cats get bored with their environment! Cat towers, trees, gyms and scratching posts are designed to help you change your pets' environment to make it a fun and safe place to explore. They come in all sorts of sizes and designs to really let your pet express their natural kitty instincts without tearing up your good furniture! Whether you are looking for condos, beds, doors to let them in and out, or even pet ramps for the infirm and elderly pussycat. Another cat supplies essential is good quality litter! Whether it is clumping litter, odour-control, pine or silica, there is so much to choose from that I have written these few pages to help you decide what's best for you and your pet. And what would you like to do about the sight and the smell of your cat's litter box? You can now cover the offending item in specially designed cat litter furniture or even use an automatic self cleaning litter box. 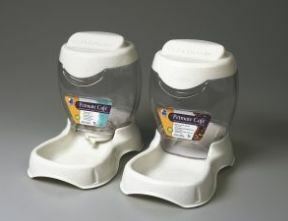 You can find out more about all these options on my pages about cat litter here. Having a cat cat flap or door to enable your cat to come and go as they please can be a good option for some owners. Your cat has the freedom to come and go as they please, you can go out and not worry about your cat being left outside all day, perhaps in bad weather. Their are many different types of cat flap available and the choice will be entirely be affected on your own personal circumstances. 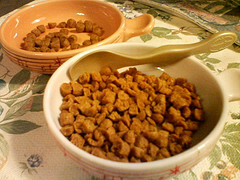 Finding the best cat food for your pet is one of the most important choices you can make. You can find out more about the differences between cat food and which one is best for your cat on these pages, PLUS you can download your own copy of the e-book "100 Homemade Cat Food Recipes" helping you to really pamper your kitty! 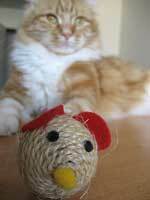 Cats love to play and you will love finding out all about the huge variety of cat toys available here for your feline friend. Scratchy toys, crinkle toys, catnip toys, teasing toys and more ... let's get this kitty party started! There are so many great cat supplies out there for you. I really hope these pages help you to make the best choices for you and your feline companion! All of the supplies I have highlighted come from companies that I feel give high quality goods and service. However, please note that as they are not my own companies I am not able to guarantee their services and cannot except any liability. Thank you.